In their latest study on the pharma market, intelligence provider Evaluate pointed out that the development and commercialisation of gene and cell therapies are turning into a powerful engine of value creation for pharma companies. The launch of these novel therapies is also instrumental in fueling the global growth of the market, where total prescription sales are expected to be $1.2 trillion in 2024. Companies working on gene and cell therapies raised more than $3.8 billion in the first quarter of 2018, which represents a 135% increase from the first quarter of 2017. Earlier in 2017, the regulator granted clearance to Novartis’ Kymriah, a chimeric antigen receptor (CAR) immunotherapy in which a patient’s T cells (a type of immune system cell) are removed, fed with DNA and infused into the bloodstream to combat leukaemia. Another CAR T-cell therapy, Gilead Sciences’ Yescarta, was also cleared last year. Gene therapy has turned into the second largest class of drugs under development, bigger than antibodies and behind traditional New Chemical Entities (NCEs). The media quickly fell into the habit of hailing gene therapies as the future of healthcare and the hottest innovation of our time, and journalists in specialised and daily outlets alike often speak of reinventing or revolutionising the industry. Reading through the coverage of gene therapies in the last three months, we found that the articles refer to six topics: research, investment, M&A, partnerships, people moves and expansions. The map was drawn using our Influencer Network Analysis (INA) methodology, which incorporates natural language processing, entity extraction, free-text data mining and dynamic network mapping technology. 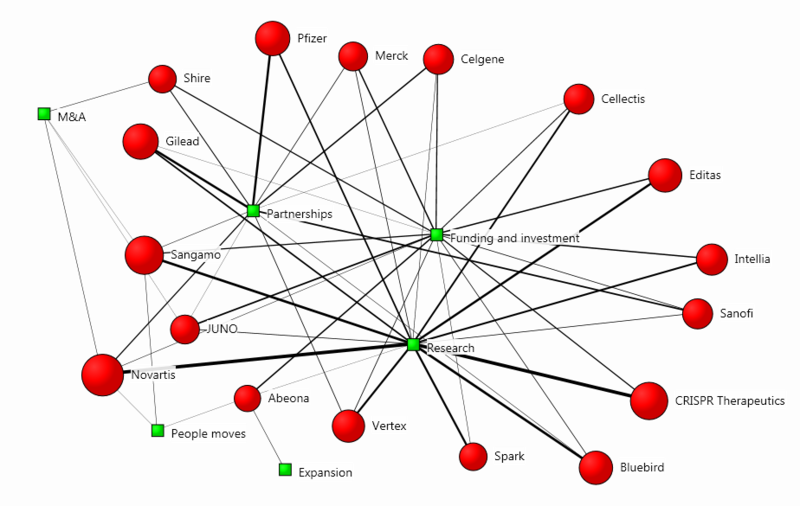 The size of each firm’s red circle signifies the prominence of its presence in the coverage, and the strength of its connection to a theme visualises the degree of association with the main topics. The methodology is particularly useful when analysing such new trends, because it depicts diffusion patterns and correlational links between key influencers and emerging issues, thus serving as a stepping-stone for more ambitious communication campaigns. Most of the articles commenting on research in general talk about both gene and cell therapies because they are used together in many cases, with gene therapies targeting diseases at the DNA/RNA level and cell therapies working at the cellular level. The coverage is predominantly positive and concerns the potential of the novel treatments, for instance, the treatment of a range of rare diseases and the development of truly personalised medicine. The main market challenge identified in the articles is the 16-month wait to start a cell/gene therapy project due to a manufacturing capacity crunch, especially for smaller firms, which need to turn to contract manufacturing organisations. This prompted some journalists to pose questions such as: “Can the gene and cell therapy revolution scale up?”. There were only 18 articles mentioning risks, some with titles such as “Is Gene Editing Dangerous?” and “Futuristic gene-editing technology may cause cancer”. The potential dangers of gene editing include off-target effects, increased likelihood of developing cancer, and some ethical consideration about the possible use of gene editing in biological attacks. However, these articles are not aimed at deterring investors, and some even recommend backing the new trend despite the risks. CRISPR has been called “the biggest biotech discovery of the century” and “a seismic shift” in medicine and is commonly viewed as the top gene editing method. It’s also cheaper, simpler and faster than other technologies because it can target multiple genes simultaneously. This popularity among the scientific community explains why the technology is the most mentioned one in articles about research and investing. The other four procedures were featuring in articles mostly for the sake of comparing them to CRISPR. In a nutshell, bacteria use CRISPR-associated system (Cas) proteins to fight viruses by cutting up their DNA. Six years ago, scientists discovered that they could harness the potential of these proteins by directing them to targeted DNA sections and thus treating a disease of their choice. Some writers, especially in columns about investing, go as far as to suggest that this technology could be the key to eventually curing all genetic diseases, while more humble analysts suppose that it will be the key to the future of developing new biologics. As per usual when it comes to innovation, pharma heavyweights acquire or collaborate with start-ups or small specialised companies. The media is increasingly eager to analyse these ventures, as we already identified in our recent research on pharma start-ups. In the case of gene and cell treatments, journalists almost unanimously hold that small-cap biotechs are the real pioneers and that gene-editing tech will soon be everywhere thanks to their work. Novartis has been deemed by many as the leading company in advanced therapies after the $8.7 billion acquisition of gene therapy start-up AveXis in April 2018 and the development of AVXS-101, a spinal muscular atrophy treatment, and Kymriah, a lymphoblastic leukaemia therapy. The company also has the non-USA marketing rights for Luxturna, a procedure targeting Leber’s congenital amaurosis eye disorder. In addition, Novartis collaborates with small specialised firms such as bluebird, Intellia and Spark. Pfizer has collaboration agreements with gene therapy start-ups Spark, Cellectis and Sangamo, while Gilead acquired stem cell company Kite Pharma last year – something we identified as one of the top trending news in our study on pharma start-ups, with Kite being the most mentioned start-up. Gilead also acquired Cell Design Labs and entered into an oncology cell therapy collaboration with Sangamo. Vertex joined forces with CRISPR Therapeutics on cystic fibrosis therapy, and Bayer became partners with that same company to work on haemophilia programs. Celgene acquired Juno Therapeutics, Sanofi bought Bioverativ, while Merck teamed up with Ziopharm and Roche expanded its partnership with 4D Molecular Therapeutics. Many of them also feature in pieces exploring research and investment. Unlike the coverage of pharma start-ups, it can be noticed that the number of articles mentioning big players and those mentioning small specialists don’t differ significantly. This goes to show that the media is well aware that the latter are the main force behind innovation in advanced therapies. CRISPR Therapeutics is the largest biotech in terms of market cap ($2.4 billion), and it has been described as having “sizzling stock performance” because it is “on the top of the CRISPR gene editing world”. Its aim is to develop solutions for serious conditions with few or no effective treatments, and it has the ambition to actually cure them. Its lead therapy is CTX001, which targets blood disorders affecting the production of haemoglobin. With the same number of mentions, Sangamo works on rare genetic diseases resulting in impaired physical and mental development. Editas deals with genetic blindness, and bluebird handles sickle cell diseases and blood disorders while eyeing immuno-oncology. Intellia focuses on the neurodegenerative disease amyloid transthyretin (ATTR) amyloidosis, and Spark targets haemophilia. The gene therapy wave is still too new to exhibit any patterns in terms of publicity and reputation management, and firms are yet to discover what works for them on the PR front. The general impression that the media creates is that this novel kind of treatment is a game changer and is going to transform the sector in near future. PRs have capitalised on the promises by promoting the therapy’s potential as a revolutionary advance in medical science. A sign of this is the more frequent use of the word “cure” in the coverage – a word which the medical profession and its PR teams are traditionally hesitant to utter. Due to the predominantly futuristic sentiment in the reports, it is important for PRs to make sure that gene therapy won’t become a subject of conspiracy theories. As the field promises to grow exponentially and attracts many investors, communication professionals should carefully deal with their expectations. Investors should be aware that this is still a volatile field where news of unsuccessful trials could lead to sharp drops in valuation, as it already happened with Juno Therapeutics, for instance. Studying the coverage using analytics tools is an effective way to get a grasp of the trend while it is still in its infancy. This would serve as a good starting point for drafting a strategy in an area where influencers, thought leaders and trend-setters are yet to establish themselves.